Hi, I am interested in your 1974 Chevrolet Corvette (stock #1220-NSH) listed on Autotrader for $25,995. I'd like to get more information about this vehicle and confirm its availability. 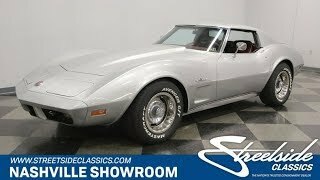 This is one of the finest examples of a 74 Vette that you will find. It is a low mileage, stock and clean car in its factory correct color and interior. 1974 marked the first year for molded bumpers both front and rear that have become the norm these days, but back then, it was cutting edge stuff. check out this beautiful Stingray. This car is presented in 14L Corvette Silver Metallic. Its not the original coat of paint, but it is the correct and original color, is in excellent condition, and looks fantastic. The molded bumpers were the end result of new governments safety regulations. GMs engineers stepped up once again with a solution that not only met the regulations, but did it in an innovative way that moved the car out of the chrome bumpered 60s and into a new era of beautiful integrated styling. This car was also meant to be driven on a regular basis and even taken on long trips, sometimes being called a touring sportscar . To facilitate that, a nice- looking and functional factory luggage rack is installed between the sail panels. Up front, the one splash of color on the car appears in the Corvette badge on the nose and a cowl induction hood flows back and up from there. Stingray appears of the fenders and the rockers are nicely trimmed out in polished metal. The interior on this car is in excellent condition and believed to be all original. The code 425 Dark Red vinyl is a beautiful compliment to the silver. The high back buckets have textured seating surfaces with smooth bolsters and show a light amount of wear, especially on the drivers seat, as would be expected in an all original interior. A three-spoke steering wheel with the crossed racing flags horn button is mounted on a tilt and telescoping column. A quick flick of the wrist to the right is the shifter for the manual transmission that is begging to be stirred around. The 160 MPH speedometer shows the 48,118 actual miles on the car and the center console holds all the gauges for fuel level, water temp, oil pressure and voltage. The ventilation system includes air conditioning to keep you cool on those hot summer days and was just completely replaced and updated by a Chevrolet dealer. Stingray floormats protect the carpeting and look great doing it. Under the hood is the original, numbers matching, 350 cubic inch L48 engine. It has received good regular maintenance with some recent updates like the air conditioning mentioned previously as well as a new radiator, water pump and all new belts and hoses. The filter housing funnels fresh air from the cowl induction hood into a 4-barrel carburetor. Neat, clean, and stock describes the rest of the engine bay including the power brakes and power steering pump. Power flows back through that 4-speed transmission to the independent rear suspension with its unique transverse leaf spring. Up front a control arm setup with coil springs and a sway bar work together with the rear end to provide the legendary handling characteristics of this car. The 4-wheel disc brakes have also been completely serviced up recently to assure you serious stopping power if you decide to let the horses run. The rubber meets the road through 255/60R15 tires all around mounted on steel wheels with polished trim rings and center caps. This is a beautiful, low mileage, all original, numbers matching car that has had the logical services based on its age already done. Call or come down and check it out.